When I found out that Fermentation had won the vote this week I was bit stuck to begin with. Every alcoholic drink at some point goes through some form of fermentation, so I had to go for a special kind of fermentation. Hence Carbonic Maceration. But what on earth is that? 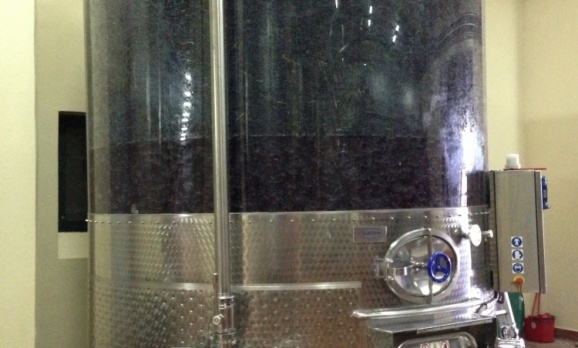 Normal fermentation is where you have all the grape juice, throw in some yeast and they convert the sugars in the juice to alcohol and carbon dioxide. In red wines this is done usually in contact with the skins and stalks and pips to extract the colour, the tannins, and some other flavours from those parts of the grape. That make sense? What do you do if you only want, for example, just the colour, but you’re not fussed about the tannin, or the other flavours in the skins. Well, you use a technique called carbonic maceration. You shove whole bunches of grapes in a pressurized vat that’s flushed with carbon dioxide. There’s no oxygen in there, so the yeast can’t function. Also the grapes are whole anyway, so they have no juice to have a go at. The grapes start fermenting inside themselves. This means all the flavours from the pulp of the grape, which tend to be quite fruity, make up the taste of the end wine. But as the grape begins to effectively disintegrate, the colour pigments are released too. In the end the weight of the grapes above crush the ones at the bottom, juice comes out, and normal fermentation happens. But this method effectively gives you very colourful, fruity red wines. Feel free to ask questions if any of that doesn’t make sense. It’s not the easiest to get your head around.